Crash during cutsene, savegame please? Also I run the game in Win7, and yes I try to run this part whit all compatibilities, dissabling options etc... nothing work. I don't have a save from that part of the game but when I get a chance Ill see if I can create one. Unless someone else can help with this? It's not a part of the game where there is a known crashing problem but 3D sound effects are known to cause crashes. Did you try enabling / disabling sound and video options? Any method to change the languaje now? I'm pretty sure the game disks are for a certain language so you cannot change the language unless you install from another disk. It was the PS2 sequel where the game DVD was multi lingual. 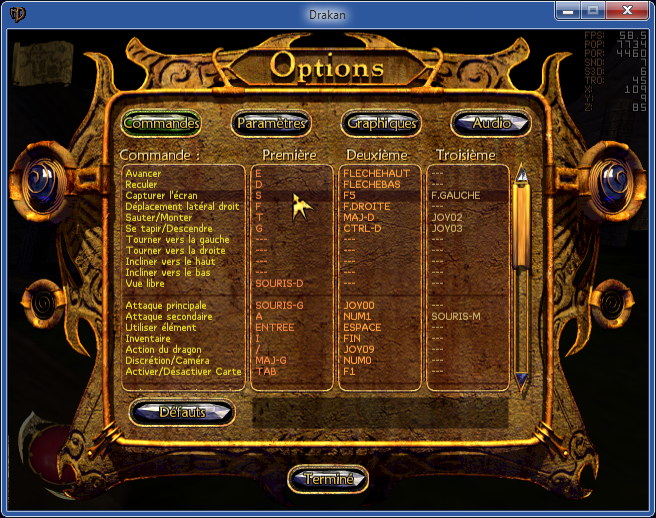 The PC version has seperate disks for each language. Also If I had sent you a save game made with my copy it might not have worked on your spanish game disk anyway. Glad you found a solution, not ideal though but at least you can play the game now. Re: Crash during cutsene, savegame please? sorry to undig an old post but i have exactly the same issue trying to install drakan back on my computer. i there a way to bypass the cutscene to reach the game just after? or better anyone who have knowledge about this bug? Have you tried my copy? Try uninstalling the version you have now completely and delete any left-over files manually, then extract Drakan folder wherever you want to have it and launch it from there. Of course, you probably also want to make shortcut to Drakan.exe on your desktop or wherever you prefer to launch it from. Does it happen even if you start a new game from scratch? Also, can you run the file integrity check just in case? Open the attached ZIP DrakanMD5.zip and put Drakan.md5 in Drakan folder, then download the Md5Checker. When you run it, click the Add button and browse to the file Drakan.md5 you put in Drakan folder earlier and see if any file fails the check. If you upload the save file before the crash, I can see whether I can reproduce it on my end. Also, under some rare circumstances, I did manage to get my game to corrupt its registry settings on one occasion. This can be fixed by starting regedit and navigating to HKEY_CURRENT_USER\Software\Surreal\Riot Engine and deleting the Settings101 entry, although this is probably not the issue in this case. Despite my efforts, the game still has some issues even after AiO Patch. With savegames, there is an oddity if the game was saved under Windows XP or earlier system, then transfer the save to a newer system, after you load it, the map icon just blinks indefinitely for some reason. Makes you wonder if there are any other side effects when loading older save games. I bring it up since this site hosts some older save games. However, we should try to get to the bottom of those crashes first. Taking someone else's savegame is just a workaround. Also, check this thread out, the dgVoodoo2 part. PS: A question for Arokh's Twin, any ideas why the forum software complains about .md5 extension if you try to upload it as attachment? i succeeded in passing the cutscene by totally re-installing the golden pack AND completely start over the game instead of using my save game from a previous version.... i think this is the point somehow THE SAVEGAME version different from what different version should expect. Now i have just a last question, is there a way to get back the french language on the golden pack...i have a CD with the original french install but i don't know what folder i should replace AND if there is a configuration file to modify in order to get back to french version. Actually, the folder from Drakan.7z I uploaded is from Gold Pack, the difference is it has been updated, some player-made levels that weren't working in the original works in this version and most of stock Drakan levels are updated for larger view distance. And some corrections were made in executable files of the game. Gold Pack is still good thing to get for its extras, although some things aren't needed anymore, eg. the old patches and the registry entries aren't really required to get the game working plus they don't take into consideration the differences of 64-bit operating systems. The Level Editor tutorials and the soundtrack are nice, but the soundtrack should be updated, those MP3s are bad in quality. Good to know your problem was merely a the bad savegame. As for the French language, yes, it is possible to restore it. I have the French version from before when someone else needed the help to get it working. The only thing that needs to be done is correctly merging it with the updated English version. I will compile the updated French version for you with all the player made levels just like how the English version is then post the link here and in the Gold Pack thread as some other people might be interested as well. Should be done by the middle of the following week, probably much earlier unless I get distracted by something else. The biggest problem with non-English versions in general is that they're even more difficult to get than the English version. I compared English and French version of the game and most differences are in sound database files (.sdb). Another difference is in one of the level specific texture databases that contains the big 3D Drakan logo you see if you don't skip startup cutscene. Dragon.rrc contains all localized in-game text, menu text and level names. RERES.dll contains localized text for the Riot Engine Options dialog. I also found out that French version has 2 older data files not related to localization (Rift Crystal.lvl and Islands.ssd). Surreal probably forgot to update them. I've put the files required to turn English version into French on Google Drive. Also, savegames are portable between different languages by design. Interestingly, key bindings are not portable because actions are described with localized text instead of universal keywords. Meanwhile i found a workaround to the french language by importing my savegame in the french version..and it works! BUT (there is always a but) regarding the BIND issue i discovered a weird things you may help me on...on the french version i can't see the straft left command option...it simply not appear as an option or command i may bind a key!! btu the straft right exist ! I checked the english version and there is the command line...but not in french one ...Weird! i tried to copy the drakan.cfg from english version to french but no success in having the straft left coming back.... any clue where i can add this command? Savegames indeed work between different languages, they only break between certain versions, 445 versions and above don't work with the early versions because developers made some fixes to the saving code. With config, transferring it between different languages clears the key bindings because actions bound to keys are described in that specific language. That's what I meant by them not being portable. But the issue you're describing with inability to bind strafe left command is new to me. Is there a gap where "Strafe Left" is supposed to be? Or is there simply "Strafe Right" command in its place? Is the command mentioned at the end of Drakan.cfg where there's a reference to all commands and keys? Maybe you could bind the desired key manually by editing said file. thank you very much for all the work you did for me !! really appreciated... The https://www.grosseteste.com/bathmate-x40-review-results Bathmate X40. I keep getting crashes during cut scenes. So annoying! Last edited by Portales on Sun Oct 29, 2017 9:24 am, edited 2 times in total.